Last night the headline news was that a crocodile had killed an unidentified man on a private property in the Ladyville/Lord's Bank area. Well, the victim was identified late last night as 47-year-old father of five Carl Michael Diaz. Diaz is from Benque Viejo, but his family lives nearby and he was fishing when the killer croc caught him. Tonight while the family mourns for this most unexpected, incomprehensible death, authorities are trying to catch the killer croc. Monica Bodden has the full story:..
A routine fishing trip to the back of Green Estate for 47 year old Carl Diaz turned into a tragedy when a crocodile attacked and killed him yesterday. He was spotted by another fisherman who was in the area at the time and heard a loud cry. That man told police that he saw Diaz being dragged down this channel of murky waters by what he described as a large crocodile. The man began making noise that scared the crocodile enough to make him let go of his prey and retreat to his underwater hide-out. "We are definitely sure that a croc killed him. We sure that he had probably finish finishing already and probably went to rinse off in the water after finish cleaning the fishes and that was when probably the crocodile was already waiting on him to get in the water I would suggest. You could see his entire head was muddy - the croc had to be dragging him because all over his head was muddy. It seems that it was quite a long ways that he was drag according to the police from where the nets and stuff were - all the way inside the little creek." Diaz was pulled from the water. His right foot was almost severed with what appeared to be a huge irregular wound on his right leg and three bite marks on his left. On the water bank were 9 fish in this small sack - which suggest to his family that after fishing he may have jumped into the water for a rinse off. "I never look at the injury at his foot. The police man told me that his foot was held by a piece of skin, but yes he had injuries to his face; his mouth had a big cut, I guess because the crocodile spin him around and then he had a blood clot up in his chest area." "This is his livelihood, this is something that he does, he is always behind that area fishing?" "Not only that area, I guess any part of Ladyville that have water where fishes are Carl is there trying to get the fishes out and I guess that was one of his main spots because he to always catch some big fish there." "Have he ever told you guys about any encounters with crocodiles?" "He used to always tell us when he sees big crocodiles. Up at Larry Flowers I would stop and tell him that some big crocs are there and he would say that they didn't bother with him, he says that he does his thing and they do their own thing." This isn't the first time that fishermen and some of the residents of Green Estate have come in contact with crocodiles. In fact, they are spotted all too often. As we trailed through the area, they were signs of skeletal remains from animals believed to have been attacked by the reptiles. "What brings me out here today after the 7pm news last night I started to get some many calls, even people visiting my house saying what will we do, you are the man and I say man for what and they say that an alligator ate a man right here in our back yard, so we need to do something about it. I sleep on it last night and the first thing I did this morning was to call the police in Ladyville and inform them that we need to do something about this croc that kill this man, so the police then told me that I need to call Audubon Society, so I call Audubon Society and they told me that it wasn't them it was Forestry Department in Belmopan. I got Forestry Department number and I call them in Belmopan and so they told me by 10am they would have someone out here. They came about 10:50am, so Mr. Vince came and we discuss and i showed him what I learn about out here and so he decide tonight that he is going to set some traps and try to capture this alligator. But my main concern is that it's a residential area and something like this happen we need to step on like now." "The prints I just saw which may or may not be the same croc, it's probably a 9-10 foot croc right off the bat just at looking at the footprints." 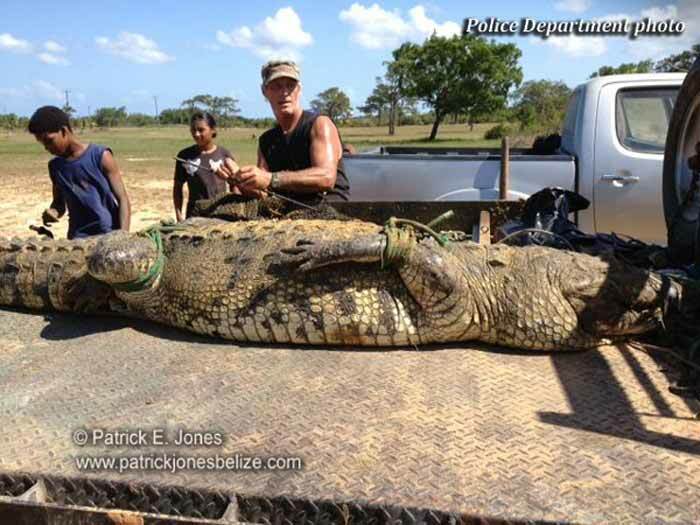 Crocodile expert and owner of American Crocodile Education Sanctuary in Belize, Vince Rose was called out to the area to do his own investigation. "Right now I am investigating an allege attack and I am still gathering the clues and evidence and see what this is all about. i have a real good idea what it's all about and not to anger everybody, I know a life was taken and that's a very serious issue but you've got to go back to what caused this and its called lack of law enforcement from illegal feedings and from fishermen cleaning their scraps at the water's edge attracting crocs to them. It when you feed crocodiles it's when they become dangerous, otherwise they run from us. I'll give you a quick little story; the first time you see a mouse in your house he runs from you, but if you spend a week putting breadcrumbs, at the end of that week you could get that mouse to come to your hand. All you've done is change that mouse's behavior - that's all you've done by doing that. Now when you do that with an apex predator such as a crocodile or a bear or a great white shark - they lost their fear of humans and now they see you as a food source or seek you out as food." According to Rose, it is scientifically proven that almost every crocodile attack is related back to a feeding - whether direct or indirect. "That's why it is so imperative that people follow the law by not feeding any wildlife. That's where it stems from. It's scientifically proven; almost every attack is related back to a feeding whether it was indirect or direct feeding. Although this was tragic, remember what caused it - the people here caused it by feeding or by not following the law. You are not supposed to be cleaning your fish scraps in the waterways. They are supposed to be taken out to sea or throw in a garbage dump or they can even bring it to us ACES and I would buy fish scraps off them to feed the crocodiles that are in containment - that's a win-win situation for everybody. That's what I am sure we are looking at." And while traps will be put in place to capture the animal, its fate lies in the hands of the Belize Police Department. "This one's fate is up to the Forest Department, it's not up to me or it's not up to anyone else. They will decide what they want done with it. The first thing I got to do is capture it and see if it's a large croc that is capable of taking a human life. If there just becomes a mass killing if crocodiles in this area your eco-system can collapse, you can have a fish die off - all kinds of things can happen. Crocodiles are needed in the environment to keep nature in balance; the keep the fish in balance. Now again that's normal Mother Nature. Once we feed the crocodiles it says the heck with fish, I am going to go with man for food - that's why it's so against the law to go near a croc, feed a croc, harass a croc, all the above and it also against the law to feed any of the wildlife in Belize." Diaz lived in Benque Viejo, but stayed in Ladyville during the week to make a living from fishing in nearby ponds. He leaves behind his wife and 5 children. But he can't be in a greater rush to find a croc than Vince Rose. Rose is the Crocodile expert at ACES the American Crocodile Education Sanctuary in Ladyville. Since yesterday he's been hunting the man-eater that killed 47 year old Carl Diaz, who was fishing in the area of Green Estate on Monday afternoon, when a crocodile killed him. "I was really close. I had him within a couple feet of me. I just couldn't get him to open his mouth to get that rope around his top jaw - we call it. It's the only croc around here. I looked at the whole area all night. This is the croc; it's probably - it's pretty aggressive. I got into the water, and it charged me, so I am pretty sure that this is the croc. And like I said, it's the only croc in this area, so, I'm just going to try again tonight, and hopefully get him tonight. Like 99.9% sure that it's a fresh water morelet's; it's not an American crocodile, and it's probably right around 9 feet, I'm gonna guess. It is probably going to be euthanized because really, we have no room for any more crocs at our facility, and I think that the Zoo is filled. So, if there is nowhere to bring him, then you can't really relocate a crocodile like that. One of my techniques is over there, that bottle, the string and the chicken, which worked great last night, he comes by, bite the chicken, goes for a swim, and then the bottle falls in, eventually, and there are glow-in-the-dark sticks in there. I can then see wherever he is swimming by just following the bottle, and that's how I got him last night. I grab the bottle, and I start pulling the croc toward me. I tried to - for like an hour I tried this; I was so close. At the end, he spit the chicken at me. So, he's got to keep the chicken in him because that string is attached to a chicken, and I can pull him right up to me. But if he spits the chicken out, I'd lose him again. So, I'm going to try that technique again tonight, but I'm also going to try and put up a couple of snares here in the water. So, if he passes through this particular canal, hopefully, he'll set off a little trigger, and two ropes will close around him." Rose is confident that culvert traps he has put in place will be effective. As for the fate of the Ladyville man eater once he is caught – that will be up to the police. The man-eater that killed a father of five on Monday has been caught. After another night of waiting with no result, this afternoon croc catcher Vince Rose and a team of young men from Lord's Bank took action: they dug the Morelets Crocodile out of his lair and captured him. It turns out to be a 12 foot mature male - and it was properly subdued, and bound on site. Rose told Monica Bodden about his capture:..
"Last night zero activity, he didn't go for any of my traps, any of my snares, any of my chicken - he didn't go for anything anywhere nor did I see him last night. This morning I went out and checked about 5:30 this morning and he still hadn't gone for any of my traps. I went back there about 8:30 and there was a local kid who said that he say the croc, so he bring me back there and we saw the croc and then I notice that he had a house/den right there because he kept sticking his head and in and out and so I knew that where his house was. Meanwhile about 10 more local boys showed up and they insisted on digging the croc out of his hole. So at that point I said what the heck (they got more muscle and energy that I do), I am not sitting and digging, I would have just set my trap and walk away, but they dug him out and as soon as they saw his head and we were able to get his head up they came over and got me. I was setting up my trap and then we top-jawed him and with those guys they pulled him out and now he is here and it is the very croc that charged me the first night because he has two white marks on his tail that I identified, so this is the croc." "He measured out at almost 11 feet. He is missing about a foot and a half of his tail. He probably weighs 500 pounds, maybe 550, he is probably underweight by 100 pounds. He is probably about anywhere from 45 - 55 years old. They don't get this big for being stupid, they get this big being smart and hiding from people. He did his job, he hide really well. Once he knew that we were hinting him from my first night - he hid in his old hole and once we found where that hole was and those guys dug him out, it was a done deal. It all work good, the community came together and these guys I give them a big hand, they help me out - I wasn't going to dig a croc out of his hole, it would have took me all day." The Chief Forest Officer today told us that the crocodile has been put down, and he will be burnt and buried. He says this is the standard treatment for man easters that have lost fear of humans. As we've reported, the crocodile killed 47 year old Benque Resident Carl Diaz who was fishing in the area on Monday. He would have pulled Diaz below the depths but another man fishing in the area scared the croc off. The Forestry department is now collaborating to set traps for the other croc on the Western Highway which attacked a 13 year old and his brother in law on Tuesday.